In addition to over overcoming your fear of public speaking, you will also learn the 12 steps toward preparing and delivering a successful presentation. You will learn the art of story and structure, the power of visualization, how to establish instant credibility with your audience, and how to engage your audience with a powerful opening and then reinforce your message with a memorable and effective close. You will also learn how to handle even the toughest question and answer session afterwards and how to turn negative questions into positive responses. Start your journey toward success today. 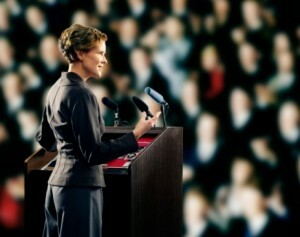 Become a more dynamic, effective and confident presenter. After all, as FDR famously said, “The only thing we have to fear is fear itself.” Don’t let your unfounded fear of public speaking hold you back. Contact us today. We can help.